Derwent recently sent me a Safari Journal which I took out last week for a trial run. It's probably best if I start by saying something about what I look for in a sketchbook - as I'm a bit picky! lie flat easily as I often work across a double page spread. 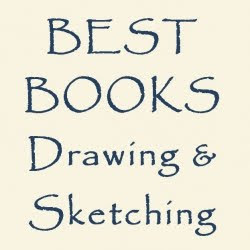 Which basically rules out wire bound sketchbooks and any where some or all the pages fall out as soon as you crack the spine and force the sketchbook to lie flat. What seems to work best are the stitched sketchbooks. be big enough and small enough. Size is a very personal issue - how big does it need to be? 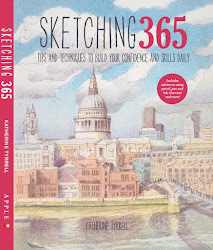 It all depends on the size you like working - and how you carry your sketching tool kit. If you're a "slip it in the pocket with pen or pencil" type then you probably like your sketchbooks to be on the small size. If it has to fit into your everyday handbag/holdall then obviously you can go larger. Personally speaking I'm a "kitchen sink merchant" who collects rucksacks like other people collect handbags and salivates over clothes with zipped pockets for secreting all sorts of useful things like battery powered erasers while out on sketching expeditions! So - on the whole - I tend towards being happier with a larger sketchbook. However the ideal sketchbook is the size which can go anywhere without me having to think too hard about how to carry it - and smaller than ideal seems to leave home more often. 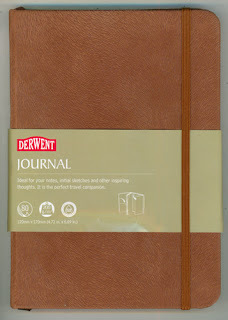 So - what are the features of the Derwent Journal? Overall it looks remarkably like a Moleskine with a few differences. The question is - how important are those differences to a dedicated Moleskine user like me? Design: Anybody who has a Moleskine will recognise this straight away. Rounded edges on front and back covers - good because they then don't get damaged and bent back when tucked into any sort of space available. A nice big fat expanding pocket at the back for 'things' (so useful when it comes to tickets and mementoes!) plus they go one better and have a smaller one at the front as well. I missed the 'in case of loss' printed info bit on the first page. I'd have happily given up a page for this - as I tend to record what's in the sketchbook on that page - but I'd started my sketch before I realised! Cover: The cover is designed as a tactile faux animal hide and it comes in two shades warm terracotta and rich earth. It's jolly nice to the touch but feels like it would be heard wearing. It also has one of those elasticated bands (like the Moleskine) which keeps it shut when not in use. I think the should be mandatory on all sketchbooks as they avoid paper being damaged inadvertently. The paper has a slight creamy colour which will be very familiar to those using Moleskines. It's very smooth but I have a slight feeling that it is not quite as 'bond' like as I like it and it's weight suggests it's lighter than the 250gsm paper used in a Moleskine - which I really like. I think the Moleskine might also be just a teeny weeny bit smoother. This journal's paper takes pencil very well indeed. 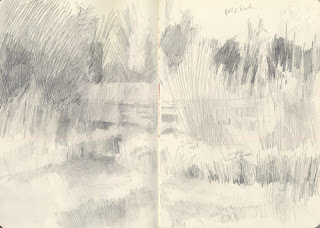 I was using a mechanical pencil with a slightly soft lead to get a good range of values in my sketch of the willows around the the bridge over what the park authority call a lake - and what I call a pond - in the local Ecology Park. A quick tip for those out with only pen and pencil to hand. Write out colours on your sketches. Those light coloured reed in the centre have an annotation of "zinc yellow"! On the next nice day I'll take a trip back to try this sketch again in coloured pencils! 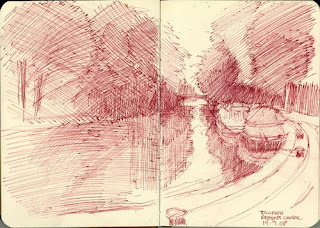 Media - pen and ink: I tried a pen and ink sketch of the Regents Canal just north of the Old Ford Lock. There's a nice wall for parking oneself on while sketching the canal and the barges. pen and sepia ink, 6.7" x 9.25"
While processing my sketch in PS I discovered that the format of a double page spread gives you a perfect 5x7 aspect ratio! 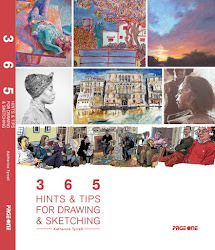 A double page spread actually measures 6.7" x 9.25" - but the ratio is the important bit if you use it for large thumbnail sketches before embarking on a larger drawing plein air or back in the studio. Media - pen and ink and coloured pencils: my very first sketch was actually of the Arts Pavilion in the Arts Park in Mile End Park - which turned into a bit of a mess - I should remember not to do reversed out neon signs! However, the mix of pen and ink and coloured pencils worked just fine. Similarly, laying down coloured pencils for the next test back home also suggested that this paper is very receptive to coloured pencils. Media - watercolour: The type of paper suggests that it's propobably not suitable for 'proper' watercolour - like the Moleskine sketchbook. So I tested it for a modified form of watercolour. 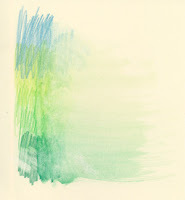 Rather than proper watercolour paint and a proper brush, I used my watercolour pencils to create a swatch of colour and a waterbrush. A very light application of water over half of the swatch does not cause the paper to buckle. Adding water via the waterbrush created a pretty good intensity of colour if not too much was added to the pencil marks. Saturation could be lightened by brushing out the colour across the page without the paper buckling. See the swatch to see what I mean. You can also see where I used a battery powered eraser to remove both pure watercolour pencil and WC pencil converted to a wash from the paper. The paper stands up well to the rapid abrasion from the eraser and allowed me to remove colour almost back to the pure natural colour of the paper - only a slight tinge remained. Unfortunately once water has been applied the removal is both less obvious and less successful. Overall though it looks as if this journal is much better suited to dibble dabble using a water brush and/or dry brush watercolour rather than saturating paper and working wet in wet. Try the latter and no matter how heavy this paper is my guess is it will buckle or refuse to accept the watercolour. If you want to use watercolour you must get a sketchbook with proper watercolour paper. Binding: The journal is stitched and consequently will lie flat - which is great. The real test always comes at the start or the end of a sketchbook when getting it to lie flat is most difficult (OK - I'll be frank "downright irritating" would be more accurate if it doesn't!) but this journal presented no problems on that front. Overall it looks well made. However there are no perforations and this is not a sketchbook for people who like to remove pages. 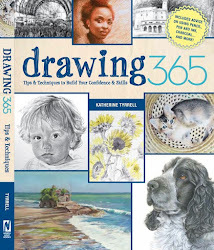 It's a sketchbook for people like me who like to keep their sketchbooks intact as sketchbooks! Size: It comes in a choice of two sizes which seem to be variously described depending on where you look on the Derwent website or catalogue. The Medium/Mini - the one I tried - is 120mm x 170mm (that's 4.72in x 6.69in). The Small/Pocket is 90mm x 140mm (3.54in x 5.51in). Frankly the latter is far to small for me - and I'd be far more likely to use a larger size - if it existed. The Medium is smaller than the larger Moleskine - and in some ways that makes it a more attractive proposition as a 'small' sketchbook compared to the larger sketchbook Moleskine is just a little too large for the handbag scenario. Personally speaking I find the small size of the Derwent Dafai Journal just a tad too small for me - but as I indicated earlier that's always very much an issue of personal preference. Price: I note that Artifolk are selling these journals online for £6.99 for the small size and £8.99 for the Medium Size. I'm guessing you may see them at various prices in the shops - depending where your local retail version of heaven is. Overall - I think this is a good quality product which will suit people who like to keep proper journals of times in their life or their travels. However, it's too expensive for people who just need some paper to try out roughs and i's not appropriate for people who want to do serious and/or 'wet' watercolour and/or want to remove their work from the stitched journal. I'll certainly continue to use this Derwent Safari Journal and will add it into my basic toolkit - and I'll also report back again when I've finished it - I have a sneeking suspicion it's going to be the perfect size for the pocket of my heavy duty cold weather anorak. I think on the whole the Moleskine continues to have the slight edge for me when I'm carrying a backpack - mainly because of the paper which has proved to be very reliable and very suitable for the media I use. However I couldn't find a Moleskine I'd happily use this instead and I think people who like slightly smaller sketchbooks would find it a good size. Last week I went to the RHS Floral Celebration in the gardens of the Honourable Society of the Inner Temple - one of the four Inns of Court, where you normally find lots of barristers. The show celebrated the return of the RHS to the Inner Temple after more than 90 years. Between 1888 and 1911 it hosted 24 flower shows (pre-Chelsea). You can read more about the History and background of the Inner Temple show but BEWARE it's a 2MB pdf file. There were over 30 floral exhibitors - you can see some of the ones that were in the marquee. 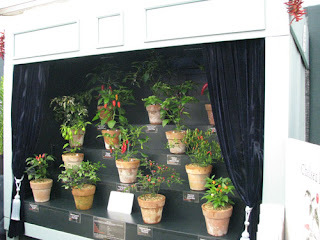 Due to the past associations it was interesting to see some of exhibitors had historical displays. I really enjoyed Pennard Plants display of period vegetables and historic gardening items. 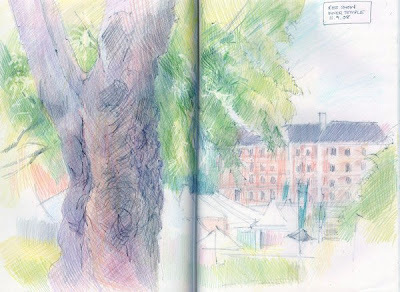 My sketch was done from the Broad Walk at the Embankment end of the garden where they had erected the tea tents - looking back to the Inner Temple grounds and the marquees. Now - I have a confession to make which is that no matter how much I worked on this sketch I could't get the value difference between tree and background - so I tweaked it in PS and it's now much better! ;) I suspect it's the paper - I've had problems before when I've wanted a really strong dark value.. The Inner Temple reminds me very much of the colleges from my time in Cambridge - and all the people I knew who left there to go and become barristers in very similar surroundings in London. I went to go and look for an old barrister friend who I'd not seen in 'forever' and found his name was now very near the top of the listing at the entrance to his chambers - but I guess it would be given he's now been there for over 30 years! This year, the Inner Temple is celebrating its 400th anniversary with the Temple Festival - running all year. Some of the famous people who became members of the Inner Temple during that period include Sir Francis Drake, Judge Jeffreys, James Boswell, Bram Stoker, Gandhi and Jinnah and Nehru, John Maynard Keynes, AJP Taylor and John Mortimer (and Horace Rumpole)! The Temple Garden is normally open to the public on week days between 12.30pm and 3pm. A plan of the garden is available on the website. The boundary of the garden - the Broad Walk - has a line of very old plane trees. I think they must have been planted after the Embankment was constructed in the nineteenth century. 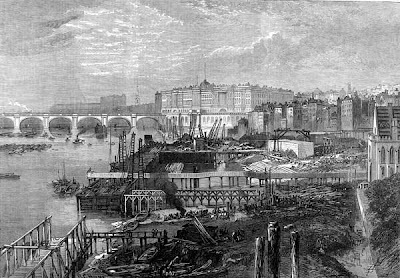 On the right is an image of the construction. The section in the foreground is near the Inner Temple and the Middle Temple. Somerset House is in the background. The bridge is the old version of Waterloo Bridge. I wonder if they started having the flower shows there after the garden was extended?